Hi! Just back from a trip up north for memorial day weekend. We had a lot of fun and I even got to shoot a magnum hand gun! I'll post some pictures soon. 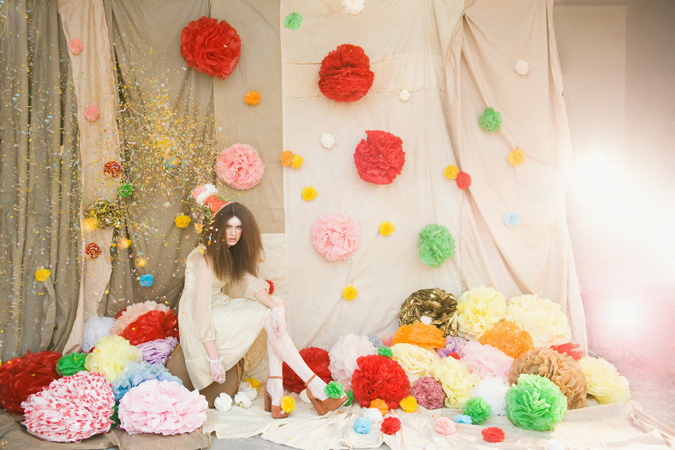 Here's a cute pom pom installation by artist Karen Hsu. They would definitely be a fun decoration for a party, don't you think? Who knew paper could be so fun and celebratory! Hope you are having a great week so far. I'm sure you all know about the outrageous and lovely Iris Apfel, one of my style icons. I love her mix of colors and how she isn't afraid to wear anything. Check out my style icon post on her a few months back, HERE. 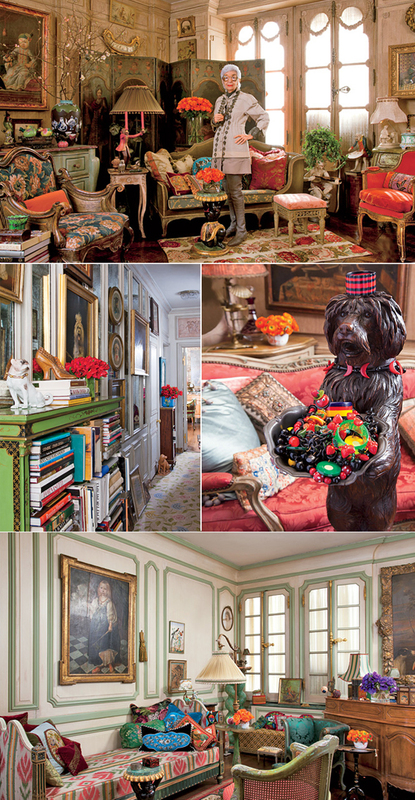 I was browsing on architectural digest magazine and stumbled upon these lovely pictures of her house and I was floored. But of course, who could expect less from this lady. Her house is as amazing as her wardrobe. 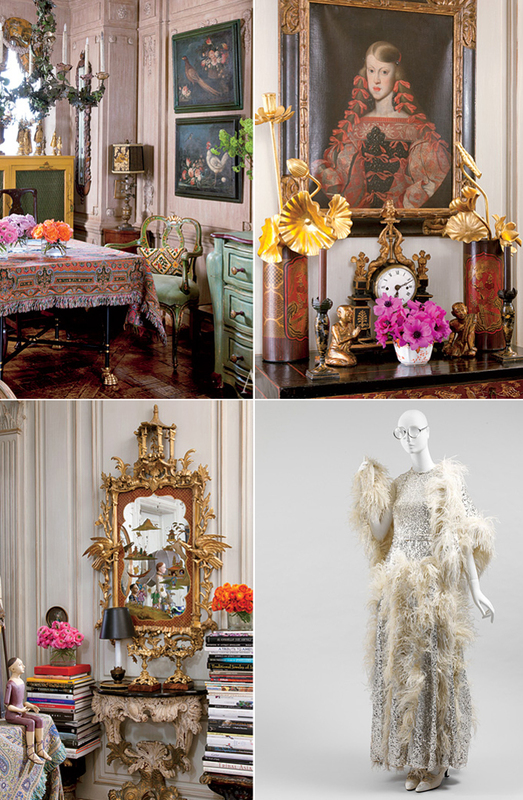 Freaking out over her mix of patterns, colors and mixing in ornate antiques into it all. WOW. Love it. 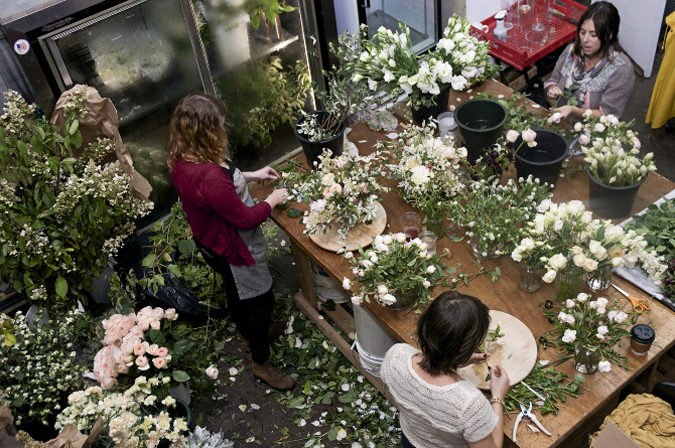 If only I had a zillion dollars to make my 650 sq ft place as magical as hers.... *sigh*. Ryan's peanut infused bourbon was such a sucess that I thought I would try my own infusion. A friend of mine told me she had pineapple infused vodka while she was on vacation and said it was the most delicious cocktail she's ever had. So, with that in mind, I wanted to try my hand at it. 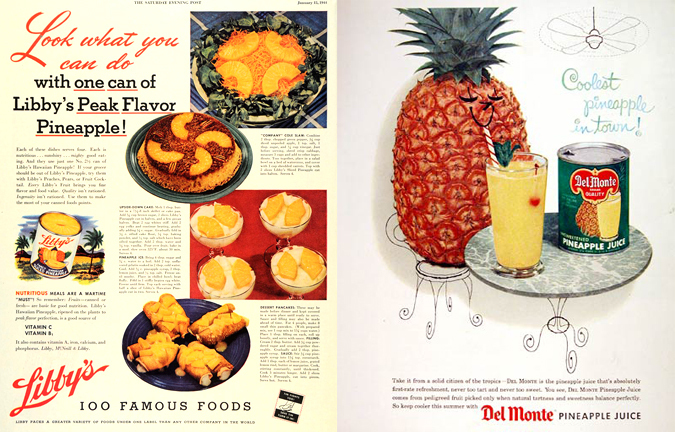 Luckily for me pineapples were in season and was able to buy mine for really cheap at costco. I sliced my pineapples and placed them gently in this outdoor beverage jar using a brick like technique so the vodka can move around it. Then I filled it up with however much vodka I still had. Then the waiting.... I stored it in a cool dark part of my kitchen and waited for days. I took it out after 8 days since I started to notice the pineapple on the very top was turning a darker color. I would've otherwise left it for 10 days. Anyway, it turned out really yummy. I can barely taste any alcohol which is a bit scary and dangerous! Even your friends that don't like "alcoholic" beverages will like this. I promise! 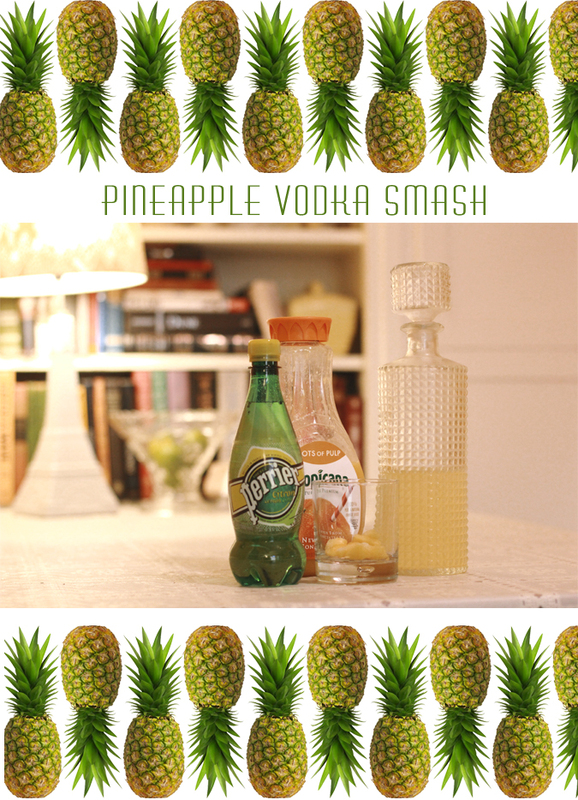 I put together a recipe of things I had on hand to make this cocktail, the pineapple smasher. I just dropped frozen pineapple used in substitution as ice cubes. Worked like a charm! Then filled my glass half way with the pineapple vodka, added some sparkling water then topped off with some orange juice. Added a mint leaf as garnish and WAH LAH! You got yourself a delicious and refreshing cocktail. Enjoy! 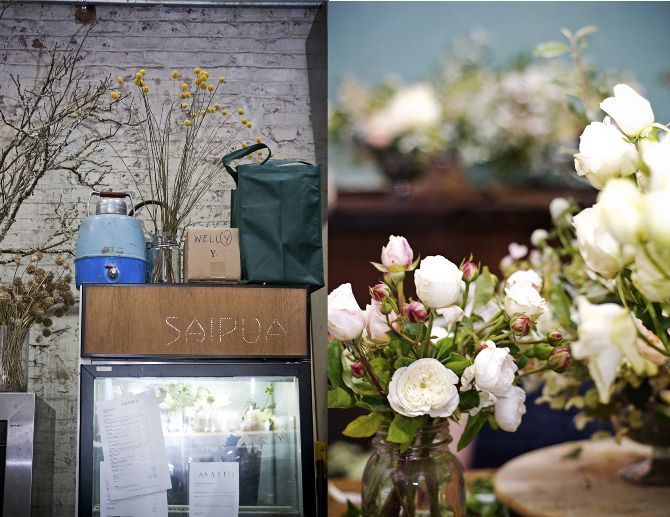 To stay in my new obsession of gardens, I found these beautiful photos of Saipu Floral Studio in Brooklyn, NY. 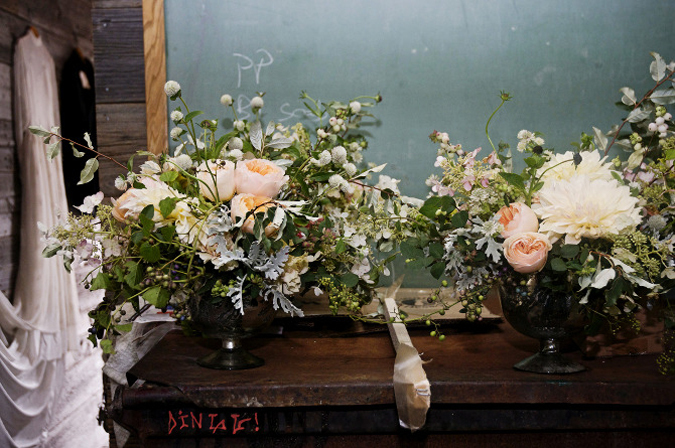 Doesn't Sarah make such beautiful arrangements? *sigh* I wish I could get my flowers there! I really am starting to see how flowers can add so much color and warmth to any place. I miss the old fashioned idea of giving natural beauty to someone as a gift. Living in Los Angeles where materialism is everywhere you look, its nice to step back and realize that beauty really does come from places that we sometimes take for granted. 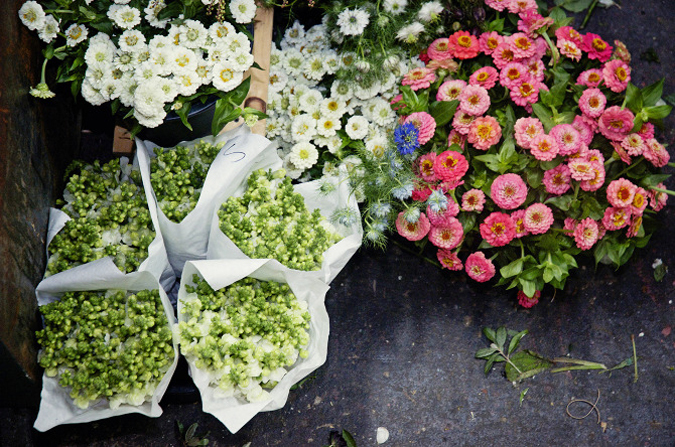 I'm opting for flowers the next time I'm consumed with what to buy as a gift. I encourage you today to stop, listen and take in the beauty outside. 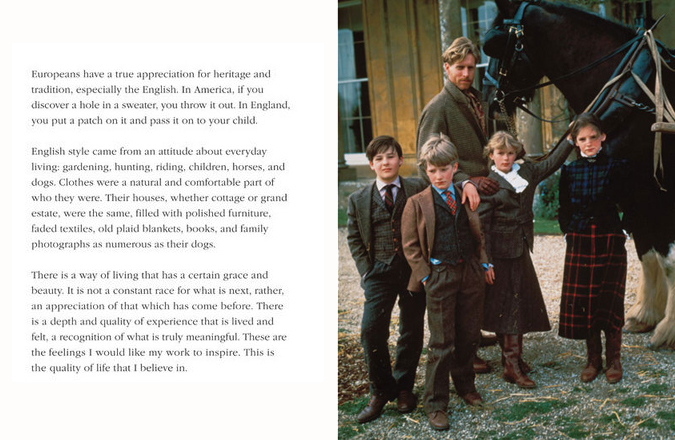 Most days I'm cooped up in front of my laptop working but from now on I will be limiting my time online and take Ralph Lauren's advice and start living. 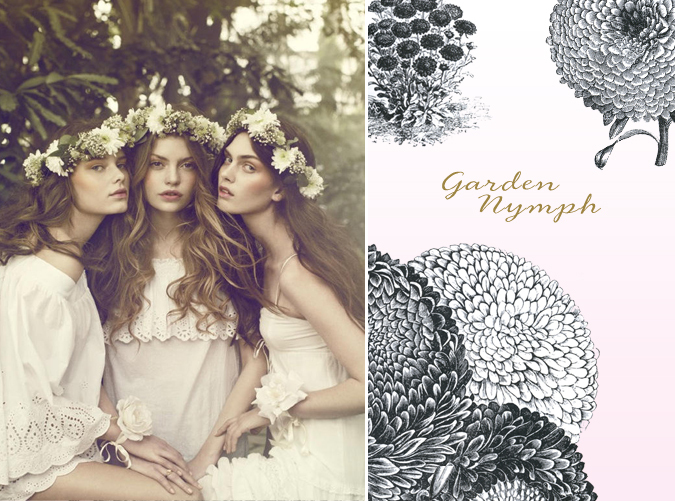 These beauties are no doubt nymphs who protect the forest and tend to their gardens. 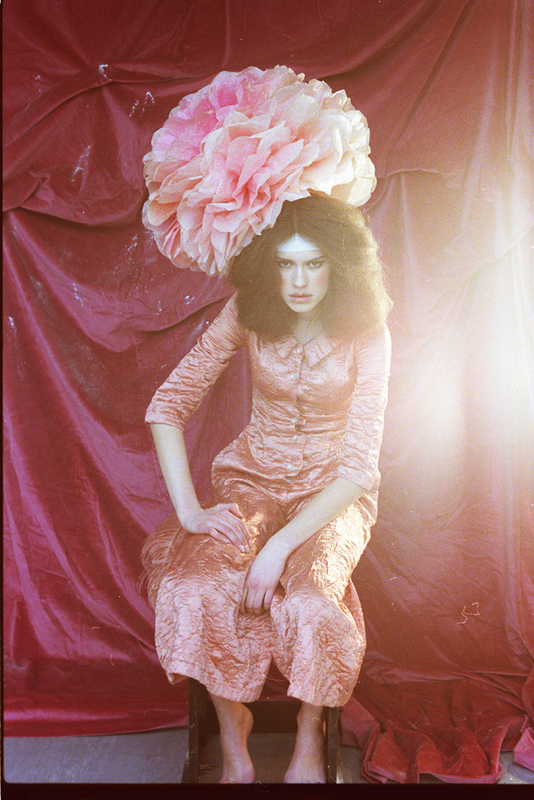 anyway, that's what I see when I look at this dreamy editorial from Elle Denmark. If only life were that simple, I'd go live in the forest and have camp fires at night and walk around in beautiful flowy dresses. I do however live in a beautiful neighborhood, right next to a park and have started my own herb garden in my patio. I'm hoping to plant some vegetables soon and then some flowers. I've had the worst of luck with flowers. Everytime I plant them, they seem to die quickly. Think I better read up and study up on which ones will be good to plant for the amount of sunlight that reaches the patio. How about you? Have you ever grown a garden? I'd love to hear your experiences! 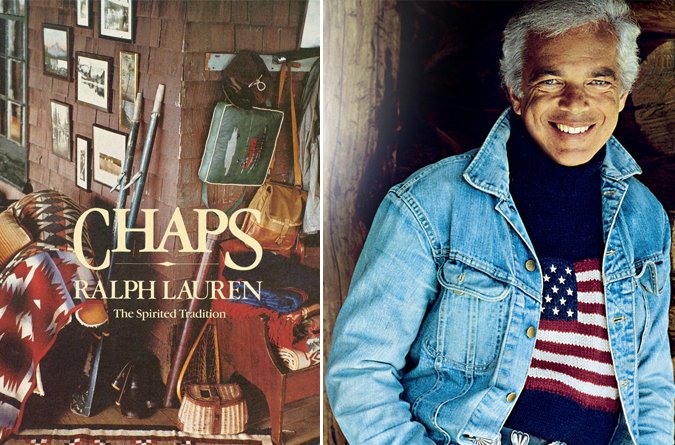 I don't watch much tv let alone the Oprah show but I will be glued to the tv today as she interviews my hero, Ralph Lauren. It will be his first interview in 20 years. 20 years! That is crazy. 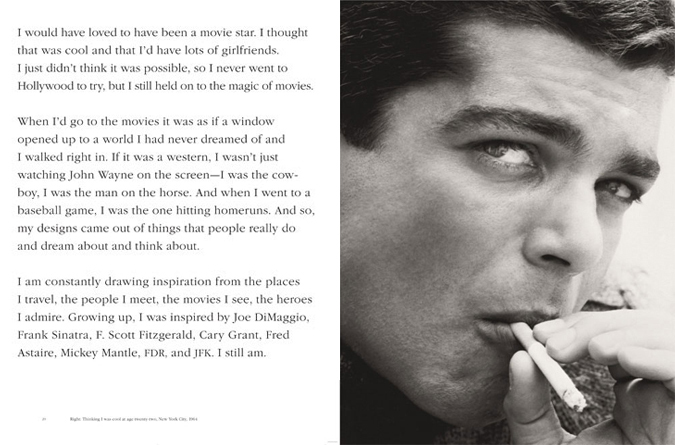 I've always been so mystified by him. He seems like such a cool guy, staying so true to himself. His ranch alone is to die for. I love his interpretations of the all american style. He is what I would consider my first "fashion" love. My mom is even more of a fanatic about Ralph and everything she owns is Ralph Lauren. She gets it, she appreciates what he did and still does for fashion. So naturally my first exposure is from my mother dressing me in polo shirts and sweaters. There's something so genuine, unique and completely western about Ralph. He is proof that you can do anything, if you trust your instinct and work really hard. With no formal design education, he studied business instead and was lucky enough to meet someone who was willing to take a risk and help launch his career and legacy. Obsessed with Arizona. She's beautiful yet has such a tomboyish look that I love. Also, I love madewell so, this is a win-win for me here. Love how they styled her short hair differently here. They pulled it back so you can't tell if she has long or short hair. Anyway, I want all these looks. Never would go for the pajama pants look but she pulls it off so nicely that it makes me want to try it out. also, are birkenstocks making a come back??? Takes me way back to my days traveling through Europe. All my swedish friends wore them, even guys. Not sure if I'd go for it though. Thoughts? absolutely adore her style. 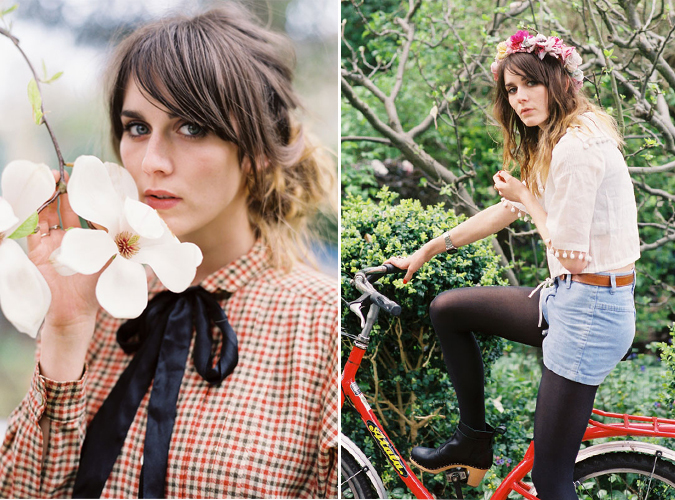 A little Alexa Chung, a little Zooey Deschanel, don't you think? Really wanting to do this type of ombre on my hair. What do you think? I think it gives a nice sunkiss look to your hair and I am in need of a change. I was going to cut my hair but I am going to patiently wait till my bangs grow out so I can cut it just like Arizona's hair. 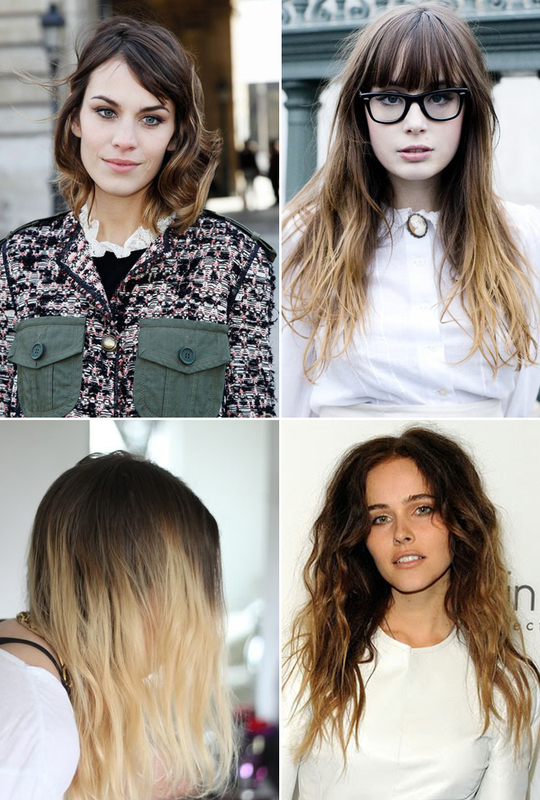 These lovely ladies look so fab with their ombre hair. Just a little inspiration for this wednesday morning. 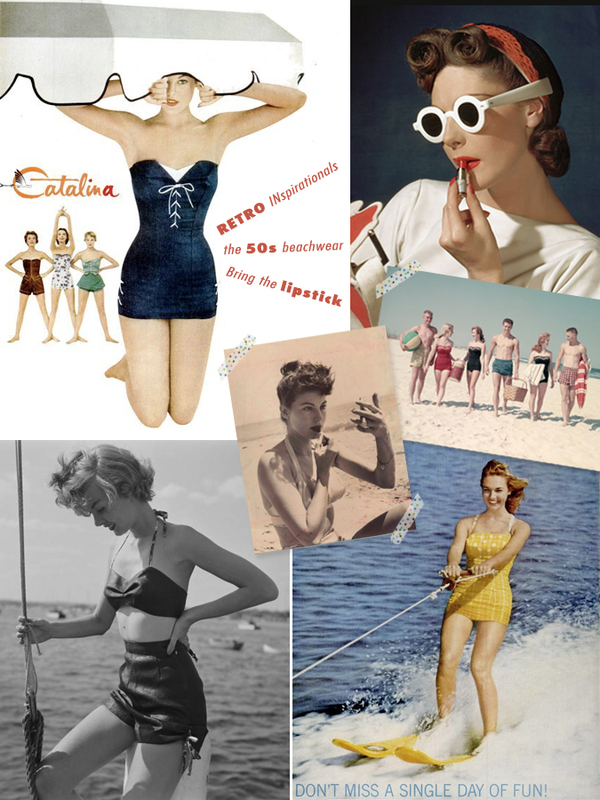 I finally bought myself a 50s style one piece swimsuit. I absolutely adore it and might I add that it is very flattering as well! My only complaint is that the bottoms are a little loose for me but its entirely my fault. I don't have much of a derrie're to full up the suit but that's a problem I've had for years now. Just have to learn how to work around it. I was talking to a friend of mine and how everyone has at least one thing that they don't like about themselves physically and the main goal is to be comfortable with it. Being comfortable in your own skin is the sexiest attitude to have these days. HA! 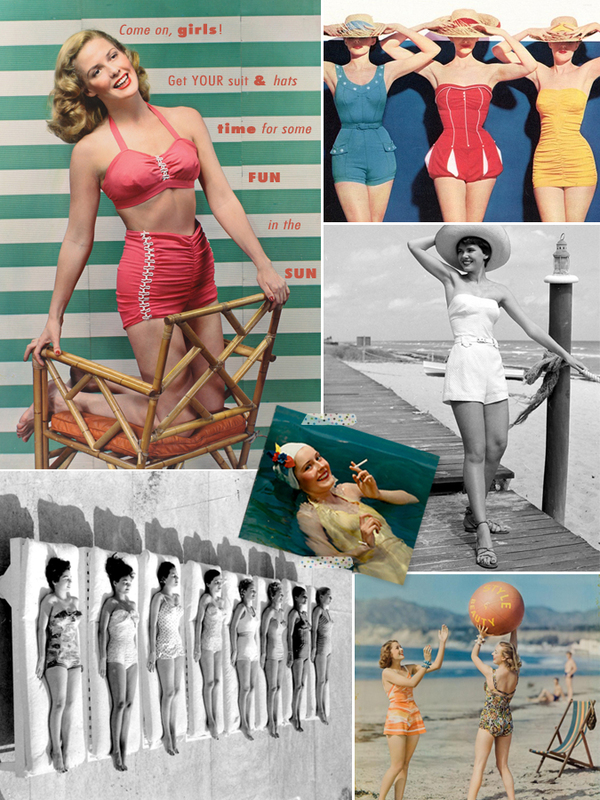 With that said, I look to these 1950s volumptious girls for inspiration. 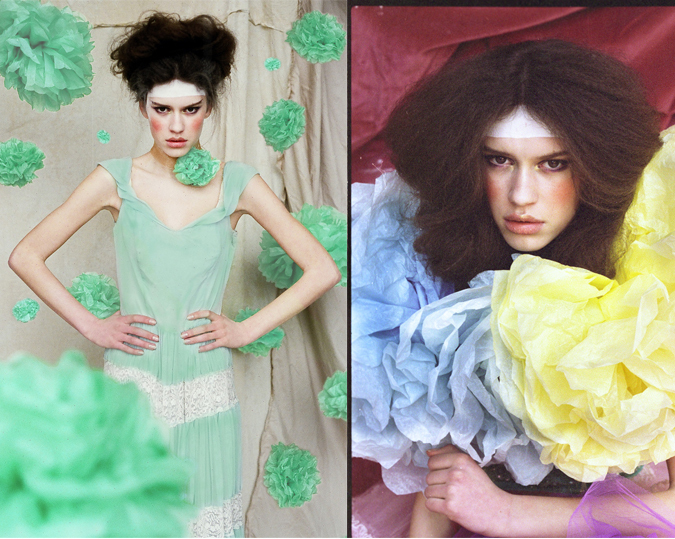 I find them so glamourous but also very funny. Who wears red lipstick to the beach? (above) and if you look at the ad in the 2nd set of photos (below) there's a girl in the water smoking a cigarette. Quite odd yet it looks so classy. Hahaha! I'll have to do a post on my collection of funny 50s advertisements soon because they are just so funny. In the meantime, enjoy some sun! Sorry for the lack of posts. My mom was visiting me and we've been cooking up a storm. She is such a great cook and taught me over 10 recipes while she was here including her infamous beer batter fish tacos. Mmmm. So good! I had so much fun hanging out with her. We both enjoy thrifting a lot so we did just that. Call me crazy but we woke up early everyday this past weekend to go to estate sales and garage sales. We also hit up all the local thrift shops and bought some great household items. My mom collects vintage pyrex's ranging from the 1940s to the 1970s. Her collection is pretty amazing. I will have to take photos of it next time I go home. Unfortunately, Ryan got sick this weekend and he never gets sick :( Hopefully he feels better. ANYWAY, today's post is about my favorite piece in my wardrobe and has been a classic of mine since I've been in high school. In fact the first garment I ever made was made from chambray and I still wear it till today. 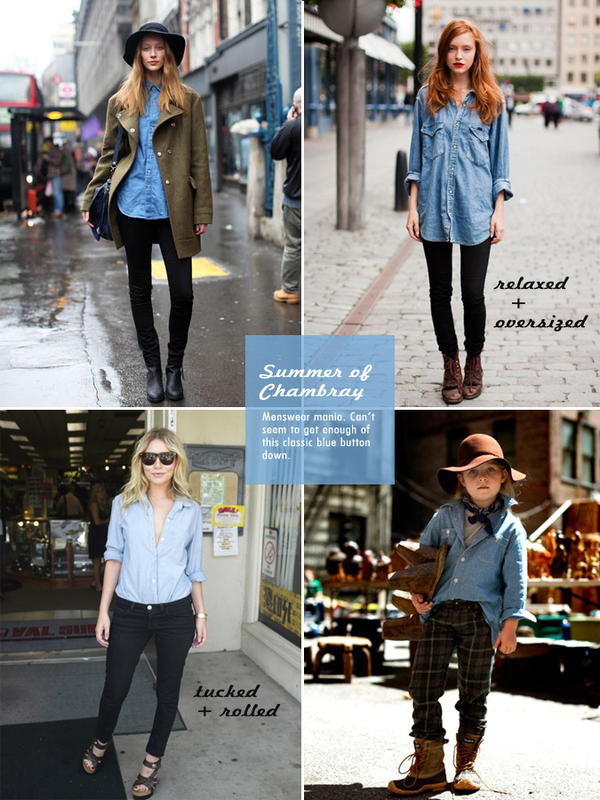 To me chambray is part of me. I've noticed that it has started to pick up as a popular trend in the past couple of years and I am so glad. Here are a few street style photos that I love. Especially the little girl. HOW ADORABLE IS SHE?!! Also the collection below is from the beloved french line, A.P.C. I am such a big fan! The different shades of blue remind me of summer and riding bikes in the sunshine.